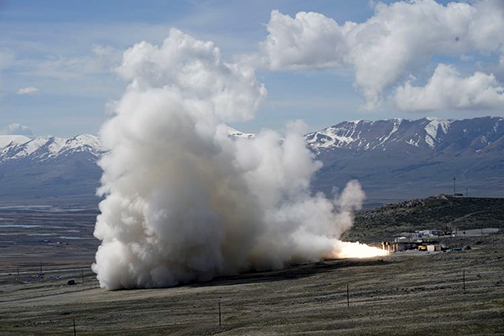 Northrop Grumman Corporation (NYSE: NOC) conducted their second ground test of a 63 inch diameter Graphite Epoxy Motor (GEM 63) today in Promontory, Utah — the company developed this new side-mounted rocket motor to add power to the United Launch Alliance (ULA) Atlas V launch vehicle. The maximum thrust of the GEM 63 is 373,000 pounds or roughly the equivalent of five B-2 Spirit bombers. Up to five GEM 63 motors can support a single Atlas V launch. The GEM 63 team developed the motor under a cooperative development program with ULA. Northrop Grumman has been supplying solid propulsion motors for a variety of launch vehicles since 1964 and is ULA’s largest legacy supplier of solid propulsion. Northrop Grumman’s expertise in solid rocket boosters combined with ULA’s history of reliability results in a strong partnership that guarantees assured access to space for national security. 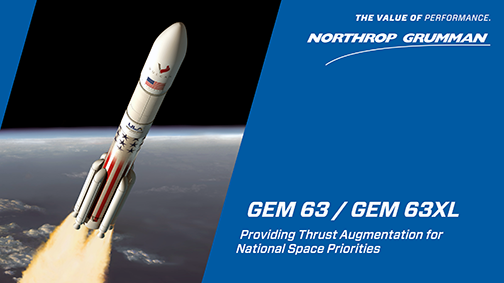 Charlie Precourt, VP, propulsion systems, Northrop Grumman, said the team developed the GEM 63 motor in just three years, an impressive accomplishment for such a complex drop-in solution to an existing launch vehicle. Tory Bruno, ULA’s president and CEO reported that this test is an important step in the development of these new boosters for the Atlas V launch vehicle and the company thanks Northrop Grumman for the continued partnership and outstanding teamwork. By flying key hardware first on the company's Atlas V rocket prior to flying it on the Vulcan Centaur rocket, it provides increased confidence for the first flight of ULA's new rocket in 2021.